Deptford 1983 by Alex Lech , May Mcquire & Paul Pestige. Liquitex Acrylic. For the mural seeker, Deptford, in South east London, is unusual as it has many examples of murals, dating from the recent works by Artmongers to past pieces like Creekside’s Love Over Gold mural. 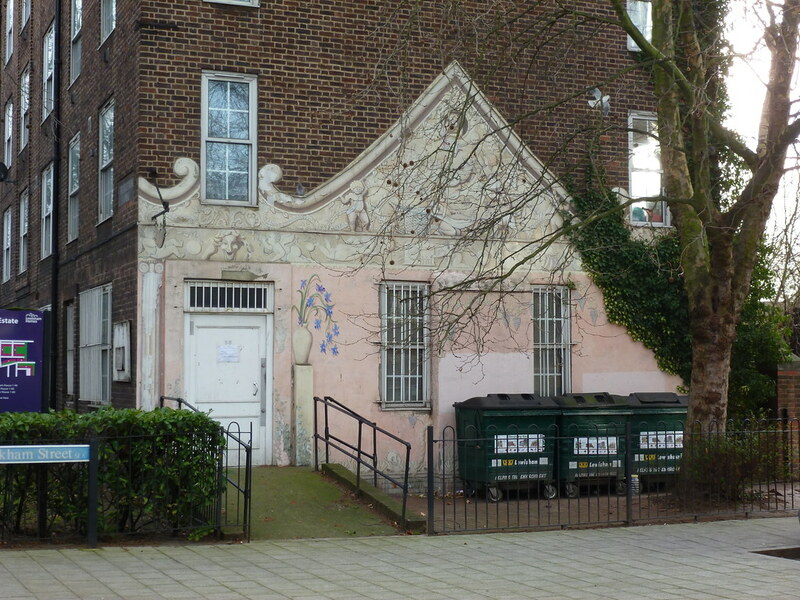 The Crossfields’ estate, opposite this piece was host to a creation of artworks in the early 1980s. This culminated in the painting of the Pink Palace, a trompe l’ioel of a pink building facade covered with putti performing everyday activities such as reading a comic or hanging the washing. It was to decorate the entrance to the Crossfield Tenants and Residents Association which is located in the bottom of a 1930s estate block. The piece was painted in 1983 using acrylic paint. The artists working on it were May Maquire, Alex Lech, Paul Pestige & residents of the estate. Paul Pestige had other works in the area and was part of the South London Murals Group – unfortunately most of these murals have gone. We are not sure yet why the piece is the pink palace and what the idea was behind it. However there are several old photos of the mural in progress on the Crossfield’s website. Some of the paint is beginning to peel. Ivy is covering part of the mural and it looks like there has been no attempt to remove it. From Deptford Bridge station, you will come out onto a busy junction. To your right will be Deptford Church St; please walk down this road and cross over to the left hand side. Keep walking past the pub and small roundabout. Frankham Street is on the left hand side and the mural is on the corner of Frankham House.